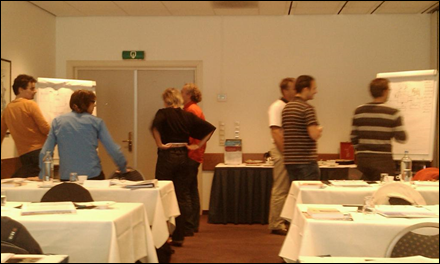 I will present an intense two day workshop in the Crowne Plaza in Antwerp. During this workshop I follow the pragmatic modeling approach presented in my book with the same title. During this highly interactive workshop participants will learn how the various modeling techniques from UML and beyond connect. Learn everything about (smart) use cases and start working directly with UML in many exercises a pragmatic case – Dare2Date, an online dating site. Topics include: UML overview, an agile approach to requirements, modeling smart use cases, testing use cases (with activity diagrams), user interface modeling, domain modeling (using class diagrams), modeling services, interaction modeling (with sequence diagrams), modeling in agile software development projects, and model driven development using UML. Participants will receive a copy of the book Pragmatic Modelling with UML 2.0. This workshop always gets rave reviews. Note that this is the 29th edition of my UML workshops at IT Works!